A highly efficient and dynamic supply chain is the lifeblood of the automotive industry, producing and delivering parts essential for just-in-time vehicle production. As automotive operations are highly integrated with the supply chain, their futures are also closely interlinked. Consequently, any factors impacting on the automotive industry filter down to the supply chain. In 2017, the consequences of uncertainty brought about by Brexit became visible. Suppliers are also essential to addressing environmental and ethical impacts arising from the sourcing of raw materials. The new Raw Materials Observatory (see page 15) created by vehicle manufacturers will cooperate closely with all stakeholders along the value chain to ensure all materials used meet the environmental and ethical standards. In 2017, Autoelectro, a remanufacturing company, became a signatory, increasing the number of remanufacturing companies to three (including Michelin which also produces new products). 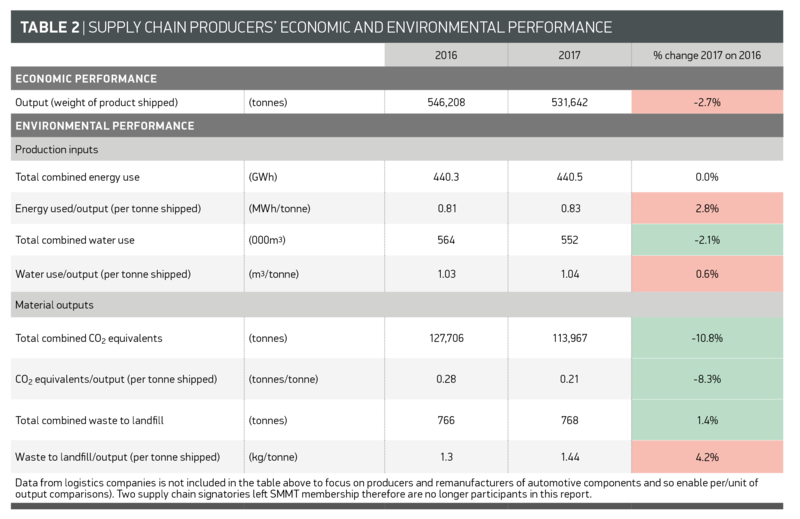 Consequently, the report now has 10 supply chain signatories representing a wide range of activities, from component production to freight and remanufacturing. As a result of the great variety of activities performed by supply chain signatories, it is difficult to reflect on their activity level. It was agreed that weight of product produced is the most appropriate metric available; however, the gradual light-weighting of products might have an impact on this metric. In 2017, the activity level defined by this metric dropped year-on-year, although only marginally. Absolute energy usage remained almost static. One signatory reported having large energy consuming processes that run continuously no matter how many parts are going through them, so it is also possible for output to fluctuate at a higher rate than energy consumption. Water usage and waste to landfill increased in absolute terms, while relative performance got worse. CO2 emissions, however, both relative and absolute, dropped in part due to continued decarbonisation of the grid. 2017 was a challenging year for the automotive supply chain with the entire industry beginning to feel the effects of the UK’s decision to leave the European Union. Without a clear picture of what a post-Brexit landscape will look like, the automotive industry has postponed key investment decisions. Despite this, in 2017 the industry publicly announced £1.1 billion worth of investment earmarked for vehicle and supply chain manufacturing, although this was down 33.7% compared to 2016 (£1.6 billion). After many years of growth following the global recession, UK vehicle production declined in 2017. However, despite the challenges and uncertainty causing a drop in economic confidence for both businesses and consumers, the supply chain showed its resilience, maintaining historically high levels. Some suppliers exporting to the EU and the rest of the world continued to benefit from the weaker pound as new international market opportunities were created as UK products became more competitively priced. Mid-way through 2017, the Automotive Council published the third iteration of its report ‘Growing the Automotive Supply Chain: Local Vehicle Content Analysis’. The findings were positive for the UK supply chain, showing that the long-term trend towards reshoring was continuing with the value of locally sourced components rising to 44%1, compared with 41% in 2015 and 36% in 2011. Research also showed that UK parts production delivered £3.7 billion more annually than it did six years previously, putting turnover for parts alone at £12.7 billion. Not only does this benefit just-in-time manufacturing, but reshoring could also return more jobs to Britain in the coming years. The automotive supply chain was once again able to showcase its strength as Automechanika Birmingham returned for its second year. Following a successful inaugural show in 2016, the event grew by 70% in 2017 with more than 800 exhibitors. A new dedicated supply chain zone was introduced, strategically located next to SMMT’s Meet the Buyer and Open Forum activities. Further highlighting the UK’s increased reshoring activities, Meet the Buyer was the largest to date with more than 60 buyers from 19 OEM and tier 1 organisations. More than 360 one-to-one meetings took place, connecting UK buyers and suppliers to discuss opportunities. In addition, 2017 saw the Long-Term Automotive Supply Chain Competitiveness programme head into its final few months (ending in March 2018). The programme successfully delivered £13.3 million in government funding to a diverse collection of UK supply chain companies for investment in R and D, Capex and skills training. Although a success in its own right, there is a need for more support from government, ideally following a similar blueprint. There was welcome news at the end of 2017 with the announcement of a £16 million fund (matched by industry) for investment in skills required to drive competitiveness. The government’s commitment to boosting the automotive supply chain and investing in the industry to ensure that it is a global player and, indeed, a leader in emerging technologies such as CAVs and Alternatively Fuelled Vehicles (AFVs), will help create new and exciting opportunities for the automotive supply chain. This, coupled with the UK’s competitiveness (UK plants are considered to be among the most competitive and productive across Europe), means that the sector should remain positive about its future. However, the automotive supply chain is embedded throughout Europe and significant challenges lie ahead, with Brexit threatening to create additional barriers to trade and competitiveness. Rules of Origin will also need to be factored in for any future trade deals the government makes. These challenges will need to be met head on to ensure that the UK’s key manufacturing sector can continue to thrive.